Boy, oh boy, oh boy! Remember that last DIY Maxi Dress I posted about? Yeah, it blew up on Pinterest!! Over 12,000 pins and counting! Gah! That's a bloggers, for lack of a better word, crack. It's addicting to have your projects pinned, and re-pinned, and featured over and over. It makes you want to come up with even better posts and just reaffirms you must be doing something right! I love inspiring others, that's what makes me really happy, it's one of the main reasons I started blogging! I'll let you in on a little secret, many may doubt it, but ANYONE can be crafty! It may come really easy to some of us, and others it just takes a little effort, but I promise you, you can be just as creative as all of these bloggers you see coming up with crazy cool projects! I was so happy with how my last dress turned out, and how much others loved it, I figured, lets keep it up! So, here I am, with another DIY dress for you! This one is a slightly harder DIY, but don't be afraid to try it! For this project, you'll need one tank (or slip dress like I used), fabric (I used sheer polyester), roughly 1.5 yards or enough to wrap around your body 1.5 times, thick elastic band, cotton thread, ball point needle, and scissors. First, cut your tank. Cut where you want the skirt to attach… In my case, I used a slip dress since the fabric was so sheer, that way I wouldn't need to line it. Leave a little room to sew the tank or slip dress to the skirt. You can see the slip dress I used below. It was a little longer than I wanted so I removed two pieces from the middle to make it shorter, keeping the bottom hem intact. The problem with this is the dress A-line so I had to take it in so it would line up with what will be the top portion of the dress. It's probably be easier to just use a tank top, but I just had this hanging in my closet and I never wear it, so I figured I'd give it some use. Next, wrap the skirt fabric 1.5 times around your waist where you want the skirt part of the dress to start. Cut off any remaining fabric. Below you can see that I am pinning the fabric to the black skirt. 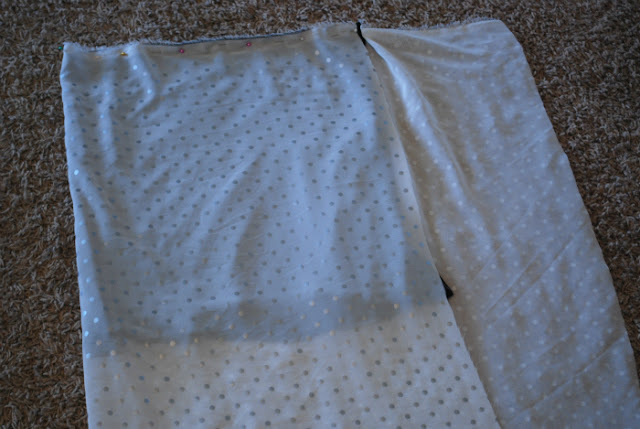 If you are using the tank method and your skirt fabric isn't sheer don't worry about this part. Make sure you have enough fabric to wrap around you 1.5 times or it will be way too tight. We want this to ruffle as we sew it to the bottom layer. You really can't mess up ruffles, so just pin it the way you think looks good. We will ruffle more later with the elastic band. You will also want to put a hem in the sheer polyester at this point. So make sure you don't cut it too short or the hem will end up being higher than the bottom layer. **If you're using the tank top method you will need to construct the skirt at this point before moving on to the next step. Simply put a hem in you skirt fabric and sew the two sides together, with the right sides of the fabric facing each other. Now, when you flip the skirt right side out you won't have a raw edge. Next, with the skirt right side out, slide the tank top in through the top of the skirt, making sure the tank is right side out. Slide it in the skirt, top (straps) first. Pin the cut edge of the tank to the skirt edge, making sure that the long seam on your skirt is in the middle of the back of your tank. The seam will run down the back of your dress. I would suggest pinning it in that spot first and then working your way around, spacing out the ruffles. While your dress is turned inside out, carefully trim the excess fabric at the waistband. Flip your dress right side out and inspect your work. Finally, you will need to cut the elastic to the exact measurement of the small of your waist. You just want it to be snug. Add the elastic band to the outside of the dress. Pin it in place, starting at the back seam of the dress and stretch it as you sew, so that it ruffles the fabric as you go. That's it! I hope you enjoyed this tutorial! If you have any questions please feel free to e-mail me and I will help! You can also see my previous DIY Maxi Dress post which has more how to pictures. Have fun! How clever. Love the fabric you chose. Darling pics. Thanks so much for sharing with Transformed Tuesday. Super cute! You look adorable! This is so cute, and something a beginner can do. I will definitely be pinning this! :) Hope it goes viral. hehe. Cute dress! Ooh congrats on all the pins! I had something my site get about 300+ repins not too long ago, the amount of traffic it brings is crazy!